A big-ticket purchase for most, there are a lot of different factors to consider when it comes to choosing a sofa or armchair for your living room. While the style of sofa and your choice of fabric require careful thought, the importance of good-quality upholstery shouldn't be downplayed – particularly if comfort is a priority. With this in mind, we have put together a comprehensive guide to help you choose upholstery that will fit with your living room design and satisfy you in terms of comfort. You'll find our guide to how to choose a sofa or armchair a useful read, too. Where should I start when buying upholstery? Don’t order a settee or armchair online without first trying it out in person, as you need to check it is comfortable and will also be able to see the full range of fabrics in store. Before you go shopping, gather together any paint or fabric swatches that reflect the design of your room, and take measurements of the space. Use your current upholstery as an indicator of size (width/length, depth and height) and to help you visualise the proportions. How much should I pay for a sofa or armchair? 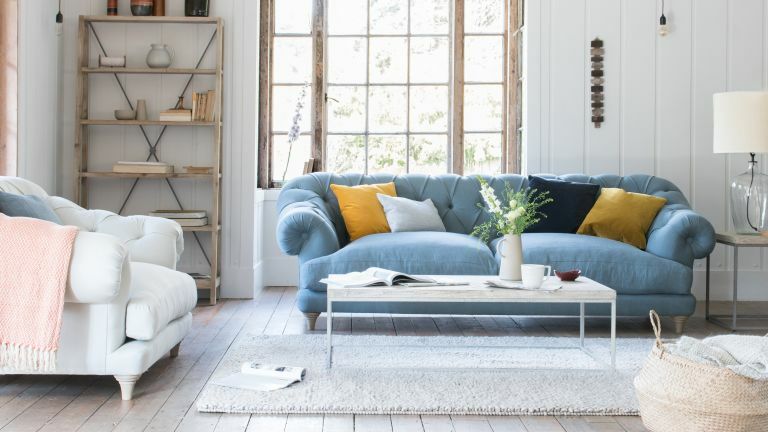 While you can easily find a sofa for under £500 – we've even identified some of the best – or pick up an armchair for less than £200, bear in mind that it will require reupholstering in the future and may end up costing you more in the long run. As cheaper models don't offer the same quality as pieces made using traditional methods, it's also worth remembering that they may not take well to attempts to reupholster. Get more expert renovation advice and home inspiration to your inbox every week by signing up for the Period Living newsletter. How is the best quality upholstery made? High tensile steel springs are preferable. Once the frame has been built, the back and base are either webbed, with a series of coil springs added to the web, or, more commonly these days, fully sprung using serpentine springs, which from a continuous zig-zag pattern. ‘Webbing or mesh can sag over time and put unnecessary strain on the frame,’ adds Kate. The piece is then padded to create the finished shape, and covered in fabric. Materials used for padding can include wool fleece, wool felt and horsehair, layered with interlinings and canvas. How can I check that a sofa or armchair is good quality? A well-made piece of upholstery should be heavy – to test it, try to lift it at the corner – and it shouldn’t rock or bend. Press lightly along the arms and under the cushion, around the seat and backs – these should be well padded and you shouldn’t be able to easily feel the wooden rails. Also examine the finish of the cover – the fabric should be pattern matched and the valance and back panels hand sewn. What difference do the springs make? Which sofa filling should I opt for? How upholstery is filled has a big impact on both the way it feels and the support it offers. The different options each have their pros and cons, but overall the choice of filling really comes down to which you find the most comfortable. grade duck feather cushion is one of the most comfortable options; the naturally curved feathers mould around the body and offer a sumptuous feel for a sofa or armchair you can just sink into,’ says Multiyork’s Kate Tansley. Lower-grade feather cushions can clump with use, so some designs are mixed with man-made fibres to reduce the problem. Fibre-filled cushions tend to be a cheaper option than feathers and still offer a soft feel but with more support. They consist of man-made hollow-core fibres, pumped full of air for fluffiness. To keep the couch looking its best, the cushions will need regular plumping and turning, but usually not as frequently as with feathers. The cheapest fibre-filled cushions have a reputation for flattening quickly and requiring ever more plumping over time, but many manufacturers are now using high-quality fibre, which offers much greater longevity. For a more structured sofa or armchair style and maximum support, opt for foam. There are a number of different options available, including hybrid cushions, which are wrapped in feathers or fibre for a softer look and feel. Be wary of the cheapest polyurethane foams, however, which can flatten over time. ‘For a very supportive and quite firm sit, opt for reflex foam, which keeps its shape well and needs little maintenance – just a simple turn every two to three months,’ says Willow & Hall’s Sarah Massouh. Upholstered furniture comes in a range of well-known traditional styles, from button-back Chesterfield couches to low-armed Howard sofas and tall-sided Knole settees, as well as countless classic shapes more loosely inspired by historic designs. In general, curvy sofas and armchairs are better suited to a traditional living room while seats with squared edges fit better in a more contemporary space. Designs with a bigger gap between the floor and the base tend to look more sophisticated, while loose cover sofas with skirts suit relaxed country-style schemes. Scroll or swan-neck arms are great for leaning on and lend an elegant look, while pea arms are a neat solution that help save space in small rooms, but don’t offer much support to lean against. What should I look for in an upholstery fabric? There are plenty of hardwearing fabrics to choose from, whether traditional jacquard weaves, damasks, crushed velvets or leathers that improve with age. ‘How a fabric wears depends on the sort of fibre it is made from, how tightly the yarn is spun and how closely the yarns are packed in the weave,’ says John Kitching, director of Northcroft Fabrics. In addition, an upholstered item should have a ticket that displays its fire resistance. Upholstered furniture for domestic use must pass the cigarette and the match test or, if it is made from more than 70% natural fibre, can be used with a fire retardant lining so long as it passes the cigarette test. Other fabrics can be backcoated with fire retardant chemicals. Should I go for a plain or patterned fabric? When it comes to choosing upholstered furniture, make sure it is in a design you genuinely love and feel you can live with for a long time, as fashions change regularly. While plain colours are more versatile, pattern wears stains and damage better. If pattern is your preference, be sure that the print you choose suits the piece it is covering. For example, traditional fabrics will look better on classic pieces, while neutral fabrics work well on contemporary designs. You should also consider the scale of the pattern – a big, bold print will go better in a large room, while delicate designs are more suited to a small living room. ‘Fabrics are a great way to capture the character of a period home, and archive prints from companies such as Sanderson or Morris & Co will add colour and pattern without throwing your decorating scheme out of line,’ says Multiyork’s Kate Tansley. If you have pets, you will need your fabric to be particularly hard-wearing. Thick leather is ideal as pet hair and light dirt can be wiped off. However, many companies offer a stain guard treatment for fabrics, which repels stains, as an optional extra. If you have cats, you may want to avoid fabrics with an open weave, such as linen, as they can get their claws into it. They are unlikely to pluck velvet, but it will pick up their fur so you’ll need to keep a lint roller to hand. Wool is a hard-wearing fabric choice, but pet hair can really bed into it, making it difficult to remove with a lint roller. Are fixed or removable covers best? When upholstery is described as ‘loose cover’ it means that all of the fabric can be taken off for cleaning or replacing. On a ‘fixed cover’ settee or armchair, the frame will be tightly covered with fabric that can’t be removed. Loose cushion covers can usually still be removed, however. ‘What’s best for you depends on your lifestyle and the look you want – if you prefer a relaxed feel and have young children or pets, then removable washable covers may be better. But a more formal-style piece really needs to be tight covered,’ says Sofa Workshop’s Paul Staden. Find more tips on choosing a sofa fabric in our specialist guide. ‘You can extend the life of your upholstery and maintain its quality and comfort with some simple regular maintenance,’ says Clive Kenyon-Brown, chief executive at Duresta. ‘As well as plumping cushions to keep them in shape, it’s important to vacuum the fabric regularly to remove dust, as if left it can become ingrained and rot the fibres,’ advises Sofa Workshop’s Paul Staden. Tetrad’s Janus Cooper adds: ‘Many loose-cover settees and armchairs are washable, but for fixed covers I recommend dry clean only.’ Having cushions dry-cleaned separately can result in a slight mismatch of colour on the furniture. Any cleaning should be done to the whole piece to balance the effect. To keep your couch looking like new, position it out of prolonged direct sunlight, as the fabric colour will fade. Some fabrics do 'pill' easily, but tend to settle down over time. Find the best upholstery cleaners in our buyer's guide, and find out how to clean upholstery in our step by step guide. The frame of quality upholstered pieces often outlasts the fabric and fillings by many years. For this reason, some manufacturers offer a renovation service for their own designs and may even guarantee the price of refurbishment at the time of original purchase. Not all manufacturers offer a re-upholstery service, but there are many small firms around the country who update sofas and armchairs, so check local directories and contact two or three for quotes. As well as updating the fabric, the upholsterer can repair any damage to the frame and springs, and refresh the filling to make your settee or armchair as good as new. Expect to pay around £300-500 for a simple armchair or small sofa, up to and over £1,000 for a larger couch or more intricate design.